Calming Lavender Body Wash by Jason Natural Products not overly scented. I use this Lavender Body Wash by Jason Natural Products in the shower and as a hand wash. The scent is subtle, it's moisturizing, leaving my skin clean and soft. This Calming Lavender Body Wash by Jason Natural Products is amazing.It has all the natural ingredients inside and provides a good quality washing for the skin, leaving it soft and moist. 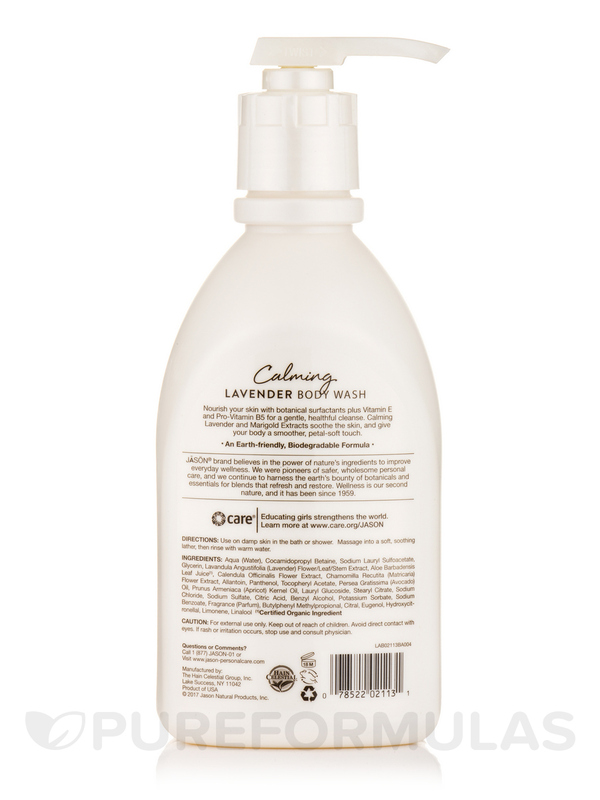 Jason® Natural Products brings you Calming Lavender Body Wash that may provide adequate nutrition to your skin. In addition‚ it could leave your body with a subtle fragrance. This product combines the benefits of vitamin E‚ vitamin B5‚ lavender and marigold extracts. Vitamin E in this natural formula could possess antioxidants that scavenge free radicals in your skin‚ leaving it firm‚ supple and youthful. Apart from this‚ it could clean your skin of grime and moisturize it. Vitamin B5 may be helpful in improving the hydration levels‚ thereby aiding dry skin. It could stimulate the repair of skin cells‚ while calming and protecting them. This lotion from Jason® Natural Products contains lavender extracts that have antiseptic properties and could improve the oxygen supply to your skin‚ thereby maintaining healthy skin. The sweet aroma may have a calming effect on your senses. Calendula officinalis is rich in carotenoids‚ flavonoids and aromatic plant acids. It could moisturize dry skin and soften it. 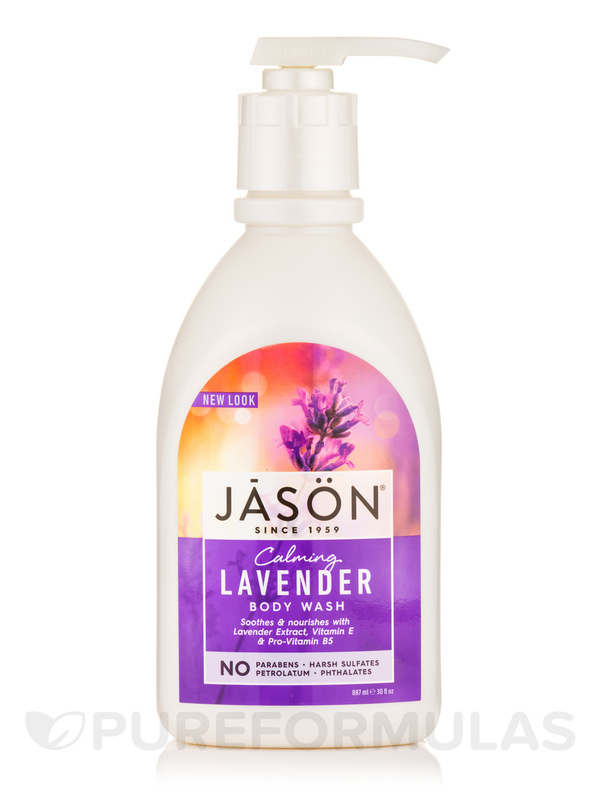 Get Calming Lavender Body Wash from Jason® Natural Products for enhancing skin health. Aqua (Water)‚ Cocamidopropyl Betaine‚ Sodium Lauryl Sulfoacetate‚ Glycerin‚ Lavandula Angustifolia (Lavender) Flower/Leaf/Stem Extract‚ Aloe Barbadensis Leaf Juice (1)‚ Calendula Officinalis Flower Extract‚ Chamomilla Recutita (Matricaria) Flower Extract‚ Allantoin‚ Panthenol‚ Tocopheryl Acetate‚ Persea Gratissima (Avocado) Oil‚ Prunus Armeniaca (Apricot) Kernel Oil‚ Lauryl Glucoside‚ Stearyl Citrate‚ Sodium Chloride‚ Sodium Sulfate‚ Citric Acid‚ Benzyl Alcohol‚ Potassium Sorbate‚ Sodium Benzoate‚ Fragrance (Parfum)‚ Butylphenyl Methylpropional‚ Citral‚ Eugenol‚ Hydroxycitronellal‚ Limonene‚ Linalool. Cruelty-Free / Product of USA. Use on damp skin in the bath or shower. Massage into a soft‚ soothing lather‚ then rinse with warm water. Everything. Lovely, relaxing scent. It's gentle cleaning. Good results from its use. I LOVE Calming Lavender Body Wash by Jason Natural Products! I can’t believe how good this smells!! So calming and invigorating at the same time. I hope Jason doesnt ever stop making this! 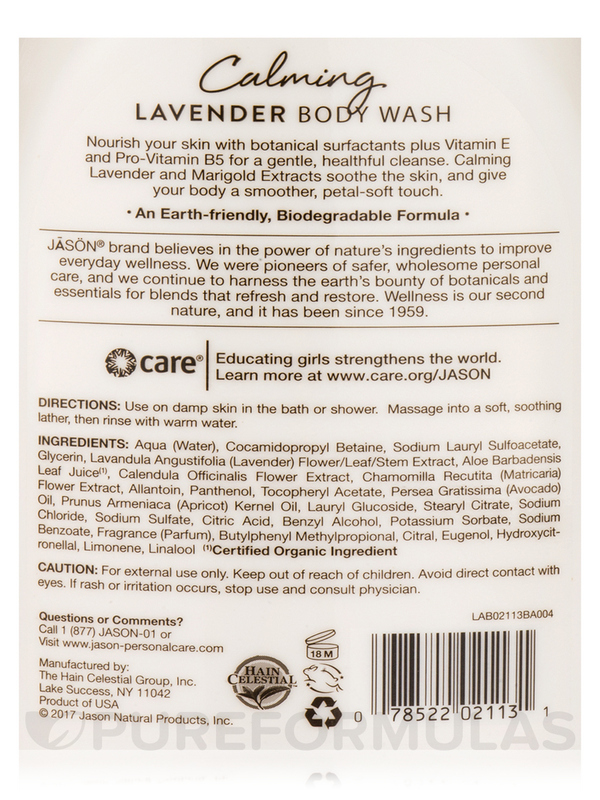 I have been using Jason Natural Products Calming Lavender Body Wash product for years. Refreshing body wash without drying the skin. The lavender scent is fresh and relaxing. The price is excellent on this site. Calming Lavender Body Wash by Jason Natural Products is absolutely the best body wash I have ever used, bar none! The smell is incredible, and my skin feels so soft after using this product. I have never found another body wash that even comes close to this product. Great smell, but not too strong. Leaves my skin feeling soft and smooth. Great Product! The cost, although cheaper on Pure Formulas than in my local Health Food store. Thank you!